So, you love hiking during the colder seasons, but you always feel overwhelmed by the packing process? Because packing is an activity that requires a lot of planning and analysis, you could easily forget something you might really need that would make your hike easier. Well, if you don’t want that to happen, you need to start using a winter hiking gear list. If your list has all the essential things, you’ll be covered. That means you need to think of different categories of winter-appropriate equipment to take, not just clothes or the regular stuff you usually take. But mainly, make sure you get things that are sturdy and reliable, and that fit your purpose. Still sounds pretty hard to do? Worry no more, we are here to help! In this article, you will learn some to-the-point advice on how to choose your equipment so you won’t get something unnecessary or that you hate. After that, we’ll tell you which our top choices are in terms of winter equipment, and hopefully, you’ll find something you like. This is the number one factor because it influences the rest of the factors too, and it also tells you exactly what equipment you need. For instance, if you’re going on a one-day ice climbing trip, you’ll need a sturdy pair of spikes, but not a cooler because you won’t be away for long. If you’re going on a prolonged hiking trip, you need items that will help you use the resources you find around, so you won’t have to pack lots of stuff, to begin with. That’s when a water purifier comes in really handy. Since you’re planning a winter hike, you need equipment that will withstand the harsh winter conditions. So you need things that are waterproof, or that can be placed in the snow without getting damaged by it. Generally, that accounts for sturdier materials being used, which might increase the overall weight. So it’s wise to make sure the equipment you need is still portable. Another thing to look for in items like clothes is breathability along with insulation because you want to be warm, not sweaty. As we’ve said just above, portability is a decisive factor for winter hikes. The main reason is that you will already by carrying more equipment, so you need new items that are compact and light. But even if you have super-human strength and can usually carry around a pretty heavy backpack, you should still aim for a smaller, lighter one for your winter hikes. That’s because the terrain is more treacherous, filled with snow and ice, which can easily destabilize you. When it comes to this, there are two things to think about. First, how versatile is a certain piece of gear during your current trip? Can more people use it? Can you use it in different circumstances? Can it replace something else, so you can make the most out of the space you have in your pack? The second thing would be to check the versatility of a certain product for the other seasons. However, that’s not always possible, especially for equipment that’s specially manufactured for ice or snow use. This is another capital factor for any purchase, but it’s especially important in winter. Since you’ll be out in the cold, you need items that work fast and that have a limited setup time. You should also consider features like grip because you’ll either be operating it with gloves or with cold hands, so you don’t want it slipping away. Besides, if something doesn’t have an intuitive use, you’ll probably need to spend more time reading the user manual, which is a real waste of time in winter, when you need to move fast. This is an obvious thing to look for, regardless of the season when you’re hiking, but it’s all the more significant for winter use. Some features might also seem durable in other seasons, but might not be that good in winter. For instance, if you’re purchasing a device that uses batteries, make sure these have a long life. However, since it will be cold and humid, the batteries might deplete faster, so you need to make sure they’re built to last even at low temperatures. With that in mind, let’s analyze a few items that we think would be perfect for your gear. We’ll analyze both their pros and their cons, so you can make an informed decision. The items below come from diverse categories and have different price ranges. Hopefully, you’ll find all the right gear for you right below. 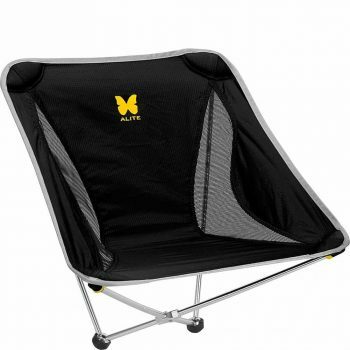 Description: The Alite Monarch Butterfly Chair is a chair that’s fit for all winter hikes and camping trips because it weighs just a little over a pound, so it’s very easy to carry. Besides, it’s made of nylon, which is a synthetic material that can sit in the snow without any problems or damage. And nylon isn’t just a long-lasting material, it’s also breathable so you can take this chair out even for summer camping trips or barbeques. The black color of this model looks well, it really pops out in an all-white environment, but there are various other colors to choose from, like blue, orange, red and green. Regardless of the color you’ll choose, you should know that the setup is also coded depending on the color, which will make it really quick. However, make sure not to place it near the campfire because nylon melts really fast. In the end, we love the proprietary design most of all. We also appreciate that this is a sturdy chair that can hold a maximum of 250 pounds, so you can use it regardless of your weight. However, people with a bigger frame might find it a bit constricting. Related: The Sawyer Products Mini Water Filtration System is great for hiking but amazing for winter hikes. You may run out of drinkable water fast, and since there’s plenty of snow around, there’s nothing like a small, pocket-sized water purifier to filter out the micro-organisms inside and render it safe. 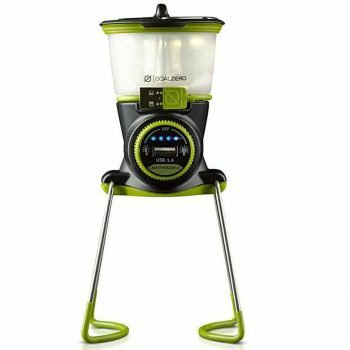 Description: The Goal Zero Lighthouse Mini Lantern is perfect for winter hiking trips because it’s small and compact. You get that from the “Mini” in its name, right? Well, it’s made of plastic, so it’s not just lightweight, it’s also resistant to all shocks and scratches. So it will still work perfectly well even if you drop it. Otherwise, you can count on its brightness thanks to a 210-lumen dual LED. The best thing about it is that you can also adjust the brightness level, and if you choose the lowest setting, you can actually have it working for 500 hours. That’s amazing in winter when it gets dark so much faster. And even if the battery runs out, you can recharge it fast with the Goal Zero Nomad solar panel or change the battery. Just make sure you get enough spare batteries from Goal Zero because unfortunately, the included 18650 battery isn’t interchangeable with those used by other devices. Anyway, you can also use this lighthouse to charge other electronic devices, like your phone thanks to the 1A USB port. But we wouldn’t advise that unless it’s urgent, or you’ll run out of battery fast. We love the design too, with legs that fold down and with a versatile setup thanks to its hook for hanging on trees and magnets for hanging inside your tent. Related: The Goal Zero Light-a-Life 350 works really well with this lighthouse, providing the perfect support. You can use it outdoors or inside your tent, it’s easy to carry, and you can also use it to hang the Goal Zero Lighthouse in a tree. 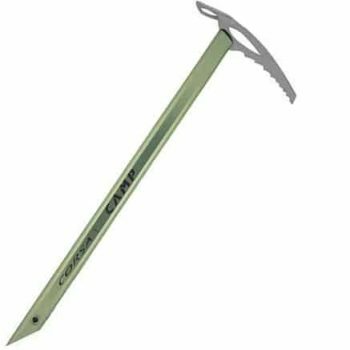 Description: The Camp USA Corsa Ice Axe is perfect for mountaineering or hiking at high altitudes when you need an ice ax to save the day. You can use this little tool either for self-arrest, as well as for all sorts of rescuing missions, but you’ll definitely need this for crossing steep and narrow places like cornices. Besides, since it’s so lightweight and compact, it won’t inconvenience you even if you’re going on an easier hike, not to mention it’s easy to handle. It’s always good to have something to break the ice, right? Especially if it’s actual ice. Well, since this ax has both its pick and its adze made from forged aluminum, you can understand how durable it is. Too bad it doesn’t include a sliding leash for an easier carry, but that can easily be purchased separately. You can also choose the ideal size for you between 19 and 27 inches length, but the bigger models don’t let ice get into the shaft like the smaller one. Related: If you’re into ski mountaineering, you need claws like the JobSite Ice Claws Snow & Ice Traction Cleats for amazing grip on icy terrain. Description: The Kahtoola Microspikes Traction System is great for climbing on icy terrain and the spikes have won plenty of awards to prove that. 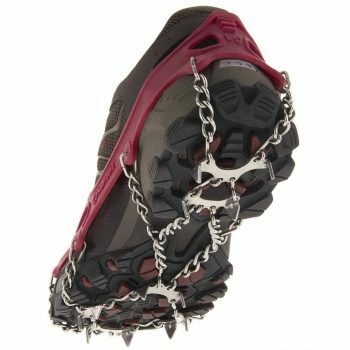 You can also use these spikes for hiking in winter, apart from trail running or ice fishing, when you need a solid grip. The 2-year warranty can attest to their high-quality design. These spikes have a length of 3/8 inches which is long enough to penetrate the ice and give you optimal stability. They’re made of stainless steel, so you know they are resistant, they won’t break during your ascent, and they also have a convenient weight. Since there are 12 spikes on each foot, you’ll get a good coverage throughout your sole. There are plenty of sizes to choose from, between small and extra large, so you’ll definitely get the right size. They weigh between 11 – 14 ounces, depending on the size you’re choosing, so that’s a bit much. However, make sure you also get a pair of crampons with you because these spikes aren’t really suited for a mushy terrain. Related: The Outad Snow Legging Gaiters are amazing for walking on snow. They’re waterproof, yet breathable so they’ll keep your legs warm without making you sweaty, not to mention they’re light and portable. 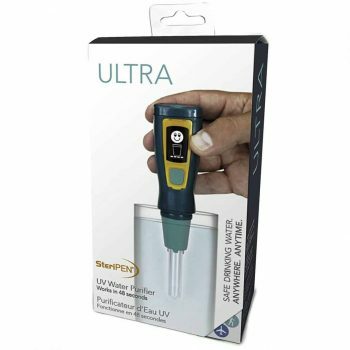 Description: The WQA-certified Steripen Ultra UV Water Purifier is great for taking out on winter hikes when you need something to destroy all the germs. You might think that it’s ok to drink melted or boiled snow, but that’s not always a good idea, as micro-organisms can freeze and then come back to life when at room temperature. So since this water purifier uses UV light, that will actually stop parasites and bacteria to multiply in melted water, killing 99,9% of them. However, you’ll have to push the button plenty of times to get the needed water. With a battery life that can help you purify 50 liters of water for each charge, you can certainly take this device for the long run. And it will last you for about 300 such cycles, so you’ll end up drinking thousands of liters of clean water. And it’s easy to charge it too, it has a USB port so that can be attached to literally anything. We love the OLED display too, it’s very clear, and you’ll get plenty of notifications regarding treatment, battery status, and the lamp. However, the light doesn’t always work well, though that doesn’t affect the water quality. Related: The Nalgene Tritan Water Bottle is great for this water purifier, it will help you store 2 pounds worth of the water you clean. We love the wide mouth, as well as the fact that it’s BPA-free thanks to its Tritan construction. Description: The Sony RX100 Camera is great for any outdoor/ nature photographs, but it’s particularly amazing for winter hikes because it has a 3-inch LCD screen that will display the colors extremely well. So you’ll finally capture that amazing, bright white snow, while the other colors are exactly like in real life. The camera has a quality sensor, it’s an Exmor CMOS 0.2 megapixels type, and a large lens of 28 – 100 mm. That accounts for an incredible light transmission and crisp images. So your photos and 1080 pixels videos will be HD, and the 3.6x zoom is amazing for capturing all the details. We love both the Steady Shot feature that keeps your image steady when you’re on the move, as well as the Burst Mode that helps you capture 10 fps. The control dials are easy to use, and the front ring is customizable. The aluminum construction is another advantage, it’s what makes it so resistant but adds a bit to its overall weight. We love the black color too, it makes it look really stylish. Unfortunately, all those wonderful features make its retail price go way up. Related: You need to keep all those wonderful pictures you’re taking, right? So the SanDisk 32GB Ultra Class Memory Card comes in really handy for that. Plus, you can use it with other cameras as well, not just this one. Description: The Yeti Tundra 45 Cooler is great for keeping your food fresh when you’re camping. It weighs quite a bit on the heavy side, so we wouldn’t recommend you carrying this if you’re hiking by yourself. But since it can store up to 26 cans of food, it’s perfect for a large group. The 2:1 ice – contents ratio is pretty good considering the other similar products on the market. And since it has 3 inches worth of insulation, the ice won’t melt either. Along with the PermaFrost insulation, the FatWall construction makes it strong against all impacts and melting possibilities, which is why it has the Bear-Resistant certification too. The rotomolded construction is really strong, we also love the T-Rex lid latches made from a strong type of rubber and with the Yeti patented technology. Basically, you can take it with you on the worst terrain imaginable, and it will still survive. Related: For a very small retail price, the YETI ICE Refreezable Reusable Cooler Ice Pack is a great addition to this cooler. It will help you substitute ice or add to the one you already have, so you can lower the temperature inside the cooler, and keep your food fresh for prolonged periods of time. In this article, we’ve tried to help you pick the best equipment for a winter hike, and that’s why we’ve chosen the best possible items. All of them are reliable and sturdy, they can resist snow and extremely low temperatures, and they’re also versatile. That said, we’re curious what you’ll put on your wish list. What will you get? What do you already have? What’s your hiking destination? Tell us all in the comments!